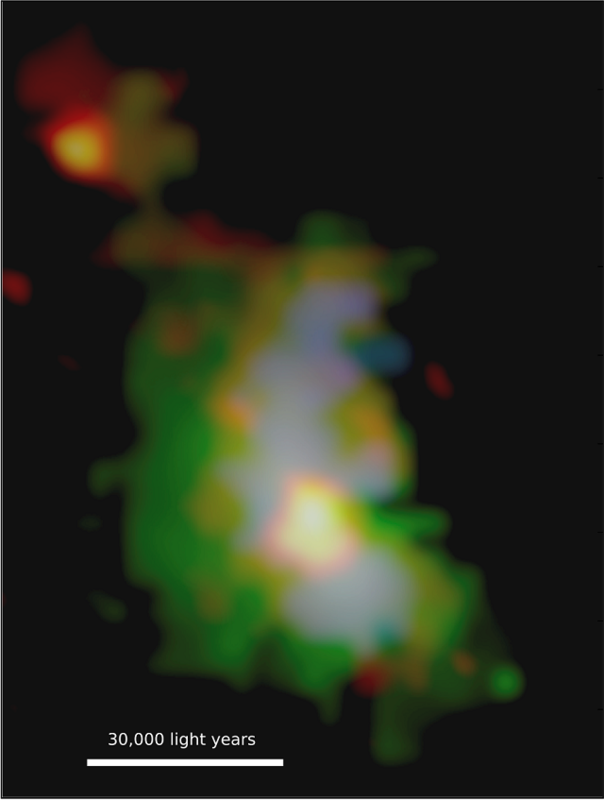 Image of 3C 298 Quasar Host Galaxy from the UC San Diego research team’s data. The four-color image shows findings from use of the Keck Observatory and ALMA. As seen from Keck, the green colors highlight the energetic gas across the galaxy that is being illuminated by the quasar. The blue color represents powerful winds blowing throughout the galaxy. The red-orange colors represent the cold molecular gas in the system as seen from ALMA. The supermassive black hole sits at the center of the bright red-orange circular area slightly below the middle of the image. Image generated by Andrey Vayner and team. University of California San Diego researchers in the Department of Physics have shed light on the formation of supermassive black holes and galaxies. The research by Professor Shelley Wright, graduate student Andrey Vayner and their colleagues outlines the physics surrounding the formation of black holes and galaxies, improving scientific understanding of how the two grow in unison. Their findings, published in the Dec. 20, 2017 issue of Astrophysical Journal directly impact theoretical work on supermassive black holes’ and galaxies’ formation and evolution through cosmic time. Their work also provides important new clues on how black holes impact the star formation history of galaxies. These bright, vigorous supermassive black holes are known as “quasars.” Wright and Vayner—who led the research and served as first author on the paper titled, “Galactic-scale Feedback Observed in the 3C 298 Quasar Host Galaxy”—examined the energetics surrounding the powerful quasar-generated winds. Their measurements place the distant supermassive black hole and galaxy named 3C 298 at approximately 9.3 billion light years away. According to Wright, the team’s research revealed that the winds blow out through the entire galaxy and impact the growth of stars. “This is remarkable that the supermassive black hole is able to impact stars forming at such large distances,” she noted. Today, neighboring galaxies show that the galaxy mass is tightly correlated with the supermassive black hole mass. Wright’s and Vayner’s research indicates that 3C 298 does not fall within this normal scaling relationship between nearby galaxies and the supermassive black holes that lurk at their center. But, in the early universe, their study shows that the 3C 298 galaxy is 100 times less massive than it should be given its behemoth supermassive black hole mass. This implies that the supermassive black hole mass is established well before the galaxy, and potentially the energetics from the quasar are capable of controlling the growth of the galaxy. To conduct the study, the UC San Diego researchers utilized multiple state-of-the-art astronomical facilities. 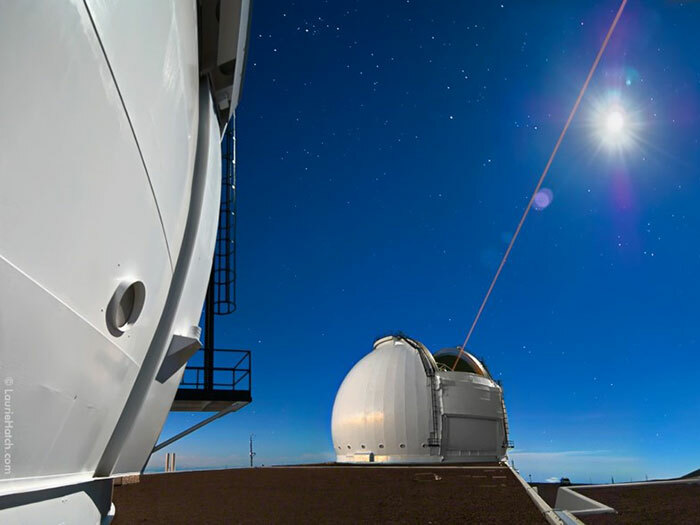 The first of these was the W. M. Keck Observatory instrument OSIRIS and its advanced adaptive optics (AO) system. An AO system allows ground-based telescopes to achieve higher quality images by correcting for the blurring caused by Earth’s atmosphere. The resulting images are as good as those obtained from space. The second major facility was the Atacama Large Millimeter/submillimeter Array, known as “ALMA,” an international observatory in Chile that is able to detect millimeter wavelengths using up to 66 antennae to achieve high resolution images of the gas surrounding the quasar. Wright agreed, commenting that the data sets were “tremendously gorgeous” from both Keck Observatory and ALMA, offering a wealth of new information about the universe. These findings are the first results from a larger survey of distant quasars and their energetics’ impact on star formation and galaxy growth. Vayner and his team will continue developing results on more distant quasars using the new facilities and capabilities from Keck Observatory and ALMA. The Department of Physics’ graduate program in the Division of Physical Sciences at UC San Diego is listed #16 according to U.S. News and World Report rankings. The first students to enroll at UC San Diego in 1960 were graduate students in physics.